This is a wild Southern Cassowary. I had seen one before in Australia Zoo but it was standing still in an enclosure about 5 meters away. This did not prepare me for the wild face to face encounter with what is essentially a deadly living dinosaur. Having arrived at Murray Falls in Queensland, I was sat in my van eating some brie and crackers with the side door open. Looking out into the forest I saw this Cassowary walking towards me. I grabbed my camera which had a wide angle lens on. Normally I photograph birds with a telephoto but it did not matter as within seconds it was stood in front of me although it looked further away through the camera. Moments after taking this photo it put its head into the van and lunged at my lunch. I instinctively moved my body between the bird and the food and said “no no no” This was enough to discourage it and it wandered off. I quickly switched lenses a continued photographing it as it disappeared back into the forest. Two days after this encounter some rangers arrived warning visitors about this partially curious cassowary and advising strategies to deal with it. Most National Parks have signs advising you not to feed the animals. This park had additional notices warning you feeding Cassowaries can result in a $3,000 fine. I have not fed any wild animals but as a photographer, it makes my life easier when previous visitors have. I am currently in Cairns to restock before a week at Noah beach in the Daintree National Park which is part of Australia’s Wet Tropics World Heritage Area. 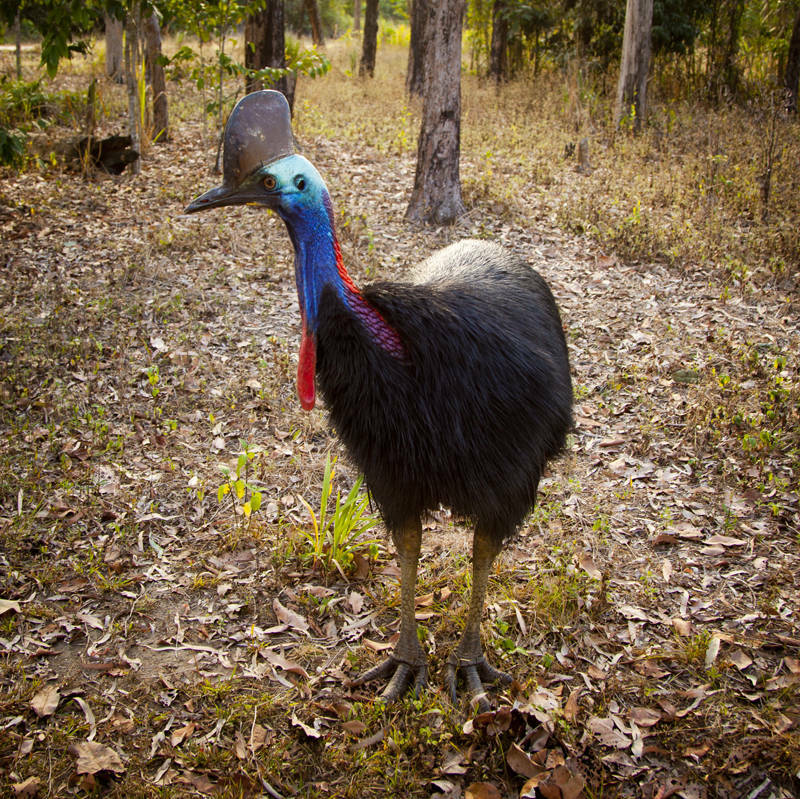 I like your Cassowary – who knew they are partial to Brie. They are the symbol/logo of Sir John Cass college so I have seen drawings of them before but never a photo. I hope that typhoon Mangkhut does not add to the Wet. Thanks, I don’t normally revisit subjects but I remember it was the symbol of your college magazine and it is rare that a bird makes itself so easy to photograph. Have started to get some rain but should not see any typhoons for a few more weeks.